The retiarius gladiator was one of the most recognisable fighters of the ancient roman Colosseum. The name of the retiarius gladiator was literally translated in Latin as ‘net fighter’, and this gladiator did indeed fight with a net and a trident. If you are thinking that this equipment seems almost more like that of a fisherman than a gladiator then you would be correct. In opposition with many Roman gladiators that where styled after military combinations or groups of people, the retiarii was in fact based on the role of a fisherman. Of course in ancient Rome life was simpler than nowadays and fishing played a large part in daily life, the Romans took this daily task and made it something common folk could get behind, you can just image the legions of local fisherman all rallying behind the retiarius gladiator. The primary weapon of the retiarius gladiator was possibly one of the most unique of all the gladiators, the trident. Not a typical weapon for battle, but as we mentioned earlier this came from the fact this gladiator was based off the likeness of a fisherman. 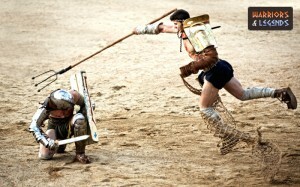 With such a unique weapon the retarius gladiator would need special training time to master such a weapon, unlike a sword it was not useful in close quarter combat. the retiarius launches a flying trident attack only to have his opponent duck. The second weapon of the retiarius is again homage to their fisherman roots and was a net, and like the trident was rather a unique weapon. Rather than being able to deal a killing blow, the purpose of the retiarii net was simply to ensnare their foes. Once trapped or entangled the retairius could use the trident without fear of a counter attack and try to end their foe. With one hand holding the trident, and one baring the net, the retiarii was what you might call lightly armoured. Some would say that the net itself was a form of defence or armour, but in the traditional sense the retiarius was the most lightly armoured gladiator in Rome. With no helmet or shield, the only armour of a retarius was their manica, an arm guard typically worn on their right arm. They would often wear a shoulder guard too, known as a Galerus which would work in tandem with the manica offer them protection when leading their stance with their right arm. The retiarii main opponent as is clear now, was the secutor, however it is thought that this gladiator also fought the murmillo on occasion as well. The retiarius fighting style was dictated by his weaponry and his armour. The length of the trident enabled the retiarii to keep distance, jabbing and prodding from long range. The light armour allowed them quick movement, as they wore no helmet their vision was clear and allowed for head movement in a way many other gladiators couldn’t mimic. The retairius was able to effectively use the net in multiple ways, he could trap the other gladiator, trying to hook the next over a limb or head, or to trap the weapon, pulling and releasing it from his foes grasp. Of course if he needed to finish the fight this gladiator had to quickly change his tactics. If he was close the retarius would need to quickly pull his knife free, his trident was much less useful in close, and with the knife a retiarius could quickly end his foe. 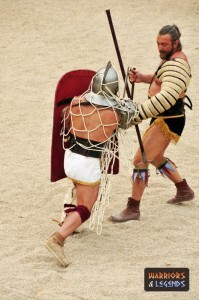 A retiarius successfully ensnares his foe with his net. A very unique gladiator, and typically the enemy of the more standard secutor, the retarius would have been an interested prospect to watch battle in the Colosseum. Questions about whether they would or could ensnare their foes, would have likely crackled in the audiences mind, with every throw of their net probably causing the viewers to hold their breath. Should the retarius successfully ensnare their foe, you can probably imagine their elation, they would finally have a chance to bring down the three points of their trident in vicious manner. Overall the retarius was likely one of the most skilled gladiator fighters, their weapons were not standard and they likely spend many hours honing their craft to increase their chances of survival in the Colosseum.